Edwin Hubble was an American astronomer and the first person to discover that there are large-scale galaxies beyond the Milky Way and that they are distributed almost uniformly in all directions. At right is a picture of him with the telescope at Mt. Wilson Observatory where he discovered what is now known as Hubble's Law. He never got to see his namesake because of his death in1953. 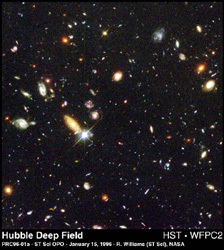 Below is an image from the Hubble Deep Field observation. It is astounding that when they pointed the space telescope at what is for all intents and purposes a blank speck of sky to any ground based telescope, the astronomers uncovered thousands of galaxies that were developing billions of years ago. From this data and more like it on the way, perhaps we will come closer to unraveling the mystery of how the universe came to look like it does today.